I'm not even sure I need to add this post to the previous one; there's not much to say about "how" to read parts two to four of The Sound and the Fury , you just have to read them as you would any other work of fiction, perhaps a little slower, and in the second part you should still pay attention to the use of italics, but otherwise the rest of the book is not as impregnable as the first part. I guess the biggest question is: "Does the novel still make sense if you skip the first section, and should you read it that way?" to which my somewhat evasive answer would be: "probably, and probably not." You might not feel like you're getting much out of the first section while you're reading it, but what you do get is an almost intangible sense of the relationships between the main characters, which you pick up intuitively, and perhaps that was one of Faulkner's goals in using Benjy as a narrator. That said, I must admit this book does not make it into my list of "best books I've ever read," and I don't think it deserves to be in sixth place on the Modern Library's list of 100 best novels of the twentieth century (but I have much bigger problems with that list, such as its inclusion of such dreadful works as Scoop and The Bridge of San Luis Rey , and the exclusion of Miss Lonelyhearts , Nightwood , and The Waves ). I am almost tempted to say that this novel gained such a significantly higher spot than the two other works by Faulkner included in the list (As I Lay Dying at 35 and Light in August at 54) simply because it was more impenetrable, rather than actually being superior to them in terms of style, content, or plotting (but I would have to read the other two before I could rightfully make such a claim). 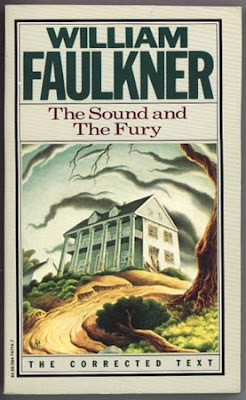 Nevertheless, I would still recommend reading The Sound and the Fury; the second part, narrated by Quentin, has an interesting feel about it, reminiscent of the classic "lonely student walking the streets" Modernist trope, as in Dostoevsky's Notes from Underground , Knut Hamsun's Hunger , and many others, but mostly I think the book should be read for the fascinating character of Jason Compson, who can rightly take his place next to The Great Gatsby 's Tom Buchanan as one of literature's greatest a-holes. The book has also made me interested in reading more of Faulkner's work, which I'm sure is exactly the kind of response every writer secretly wishes for his readers to have at the end of his book.